Dedicated RN with 20 more years of bedside nursing experienced. Highly trained with strong clinical abilities. Patient-oriented and work well with diversity. Provide direct for infant on respiratory support. Provide patient/family education regarding newborn care, health maintenance, disease process and prevention. Utilizes the nursing processes, assessed, planned, provided and evaluated nursing care based on patient condition. Years of critical care experienced with premature critically infant. Maintain accurate, detailed reports and records. Record patients' medical information and vital signs. Monitor, record, and report symptoms or changes in patients' conditions. Order, interpret, and evaluate diagnostic tests to identify and assess patient's condition. Maintaining patients and families safety at all times. Inform physician of patient's changed of conditions. 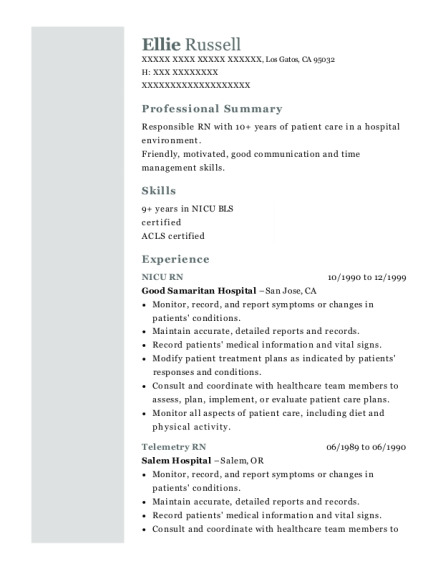 NICU-RN May 2008－Present Bakersfield Memorial hosptal bakersfield, ca Started working full time to casual positions as an NICU-RN. Monitor patients for changes in status and indications of conditions such as sepsis or shock and institute appropriate interventions. Evaluate patients' vital signs and laboratory data to determine emergency intervention needs. Prioritize nursing care for assigned critically ill patients based on assessment data and identified needs. On transport team. Transport high risk infant via ground ambulance. Document patients' treatment plans, interventions, outcomes, or plan revisions. Collect specimens for laboratory tests. Document patients' medical histories and assessment findings. Conduct pulmonary assessments to identify abnormal respiratory patterns or breathing sounds that indicate problems. Advocate for patients' and families' needs, or provide emotional support for patients and their families. Administer blood and blood products, monitoring patients for signs and symptoms related to transfusion reactions. Monitor patients' fluid intake and output to detect emerging problems such as fluid and electrolyte imbalances. Identify patients' age-specific needs and alter care plans as necessary to meet those needs. Assess patients' pain levels and sedation requirements. Administer medications intravenously, by injection, orally, through gastric tubes, or by other methods. LVN-RN Jan 2000－Jan 2008 Nurses internet inc. Bakersfield, Ca Working for, which is a travel nurse agency contracted to Kern medical center, a responsibility in the different department as a primary nurse which has involves work in medical-surgical, post- partum, ER, Peds, NICU, DOU, and ICU. Interview clients, review records, conduct assessments, or confer with other professionals to evaluate the mental or physical condition of clients or patients. Counsel clients in individual or group sessions to assist them in dealing with substance abuse, mental or physical illness, poverty, unemployment, or physical abuse. Collaborate with counselors, physicians, or nurses to plan or coordinate treatment, drawing on social work experience and patient needs. Monitor, evaluate, and record client progress with respect to treatment goals. Educate clients or community members about mental or physical illness, abuse, medication, or available community resources. Assist clients in adhering to treatment plans, such as setting up appointments, arranging for transportation to appointments, or providing support. Refer patient, client, or family to community resources for housing or treatment to assist in recovery from mental or physical illness, following through to ensure service efficacy. OTHER technology: EMR softwares, open vista and BCMA. 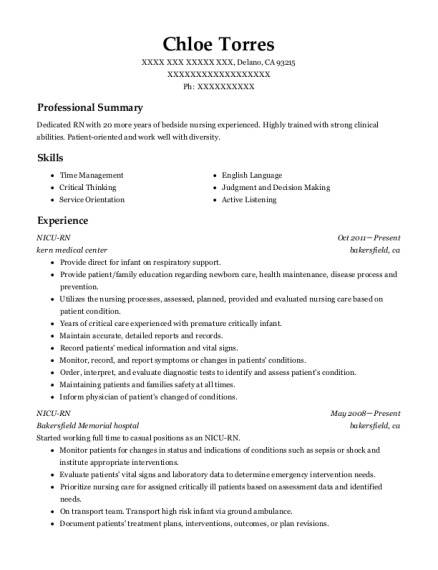 This is a resume for a NICU RN in Delano, California with experience working for such companies as kern medical center and Bakersfield Memorial hosptal. 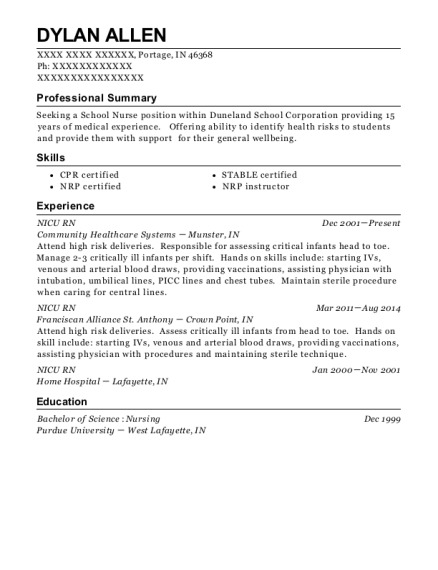 The grade for this resume is 0 and is one of hundreds of NICU RN resumes available on our site for free. 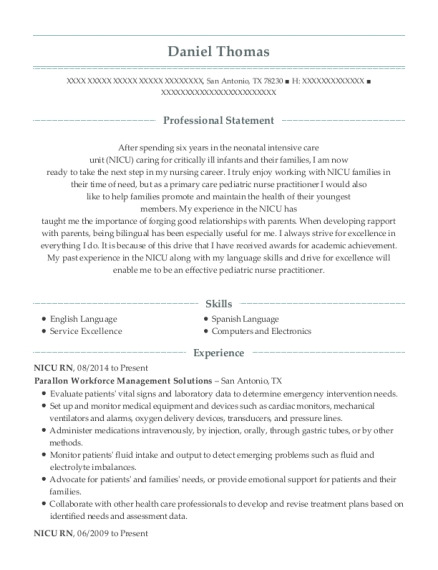 Use these resumes as templates to get help creating the best NICU RN resume. © 2019, Hiring Products Limited, All rights reserved.